We’d hesitate to call the Excel 600D’s layout unique – we’ve seen its ilk before – but there’s nothing else quite like it on offer today. In fact, it has the sort of practicality with a touch of quirkiness that we used to associate with Autocruise motorhomes, in their pre-Swift Group days. for their balance of support and squishiness. Of course, you can swap the offside settee for a forward-facing half-dinette complete with two extra seatbelts (for £750 extra), but we can’t help feeling that this option is likely to have more appeal with some of the Excel’s other layouts. After all, the 600D’s dining area seats just two. To the rear of the habitation door is the Excel’s second seating area – a conventional pullman dinette with wall-mounted table, but designed for just a couple. The galley is almost opposite. The floorplan is completed by a corner washroom with separate shower on the offside and a neat wardrobe and chest of drawers unit in the centre of the rear wall, between the pullman seating and the bathroom. There’s no doubt that much of the 600D’s appeal lies in the fact that its lounge and dinette are quite separate – or that you can have breakfast while your other half has a lie-in, or vice versa. 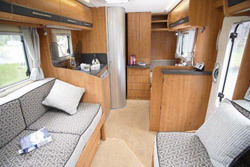 When it comes to meal times, the small rear nearside dining area is just the job for two, but Auto-Trail have not ignored the possibility of friends dropping in, so a second table is available for use up front. For serious feet-up lounging, the Excel also has several options up its sleeve including the fact the offside sofa is long enough to spread out upon and the Excel thoughtfully provides a couple of matching scatter cushions for you to prop against the end of the galley. The Excel gets a separate dinette and despite a stem to stern measurement of just over a metre (around 40 inches), the galley is pretty comprehensively appointed. The main bed is almost as straightforward to make. Each settee’s base simply slides forward, taking support legs with it. Once they’ve met in the middle, the backrest cushions fill in the gaps and a folding flap and an infill board plus extra cushion add a necessary few extra inches of width to the bed on the nearside. The only compromise is in the washroom. It does get the latest C250 swivel cassette toilet from Thetford (the one with the wheeled cassette) and a separate shower, too. However, space is a little tight for sitting on the loo! Even with the ideal spec of Sport Pack, cab air-con and the larger 130bhp engine, you could drive an Auto-Trail Excel 600-D away for under £40,000, which sounds like great value. While other layouts have more direct rivals elsewhere, we also applaud Auto-Trail’s bravery with the more maverick approach of the 600D. This layout won’t be for everyone, but if you’re looking for a compact pure two-berth, it’s a new option that’s worth a closer look. 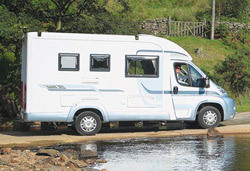 *Motorhome insurance cost based on 2009 Auto-Trail Excel 600D valued at £35,999. Fitted with manufacturers immobiliser and Thatcham Category 1 approved alarm and approved tracking device, kept at home at SN4 7DP. 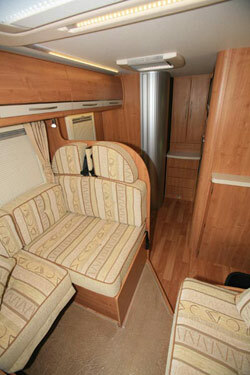 Motorhome owners – professionals over 50 years old with no claims, convictions or health conditions in last 3 years. 4 years no claims bonus mirrored from car policy and 2 years motorhome driving experience. 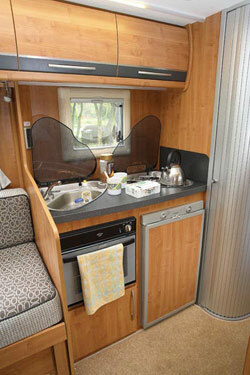 Members of motorhome club doing less than 7000 miles annually. £250 excess applies. European cover £4 extra, European Breakdown £42 extra. Premiums include insurance premium tax at 5% and are correct as of 17/12/08.